What year was it now? Oh, it’s 2015 already and the technology is gradually rising one after another, and a lot of gadgets today are invented to cater one person daily needs. As of now gadgets like Android phones, iPhones are categorized as smartphones or mobile phones the earlier time, due to its advanced computing system that everyone seems to be amazed with and enjoy. But how much does these products cost today? Just an example is an ordinary old modeled Android phone that has the 2nd operating system version, with the ability to send SMS, make calls, video calls, connect to the internet, play basic games, shoot pictures and etc. All of these features for a price of $40.00, for many will say the price is still a bit greater than the features presented, while someone will definitely say, I won’t even waste a dime for that awful mobile phone. Others may answer the same while others might comment something, but either way, there’s no way I’ll be buying that stuff though. But did you know that even the price of the latest gadgets today are still far with the first invented mobile phone? Maybe you have a smart phone now having a price around $500, $700, $1,000, $2,000 or something like $3,000! Wow, I won’t spend much of that money for a single smartphone though. But anyways if you think that the smartphone of yours is kind of expensive, well then think again. 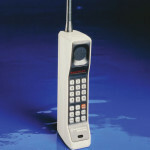 The first ever mobile phone in history is invented around the year 1984, about 31 years ago. I know many will disagree, but let me first clear that confusion. At 1984 the first mobile phone called Motorola Dynatac 8000x is considered by others as a car phone which was first originated in the year 1940. This mobile phone is the first ever known handheld cell phone having the size of 13 inches long, 3.5 inches wide and 1.75 inches thick, so big that even the makers of this phone gave it a nickname as “The Brick”, but that is not all, this gorgeous mobile phone has the battery capability that can last up to 1,800 seconds, that is about 30 minutes of your entire life quite powerful, isn’t? So to say, it is the best mobile phone that time since it is the first one after all, compared to Apples and Androids latest release, the first mobile phone’s price will make your jaw fall, since it is first sold for about $3,995 almost $4,000. That is a load of the latest smartphones at this period. But anyways, if you do live in that current time, you might also be one of those persons longing to have one of that Dynatac 8000x mobile phone, and in fact, the manufacturer of that mobile phone didn’t want to mass reproduce its model, since they just funded the development of that first mobile phone for only $100 million, that is about $200 million today. And then the story goes, with that cheap handheld phone you have there. The post about the First Mobile Phone was outsourced to a freelancer to give our readers some insight about the very first cell phone. The First cell Phone was referenced in this article but needs some more insight to further highlight other point that marked its invention. If you have more insight on the First cell Phone, want to give other tips about the topic of discussion (First Mobile Phone), please do share with us below or create a new thread in the forum section.